Antivirus 10 ransomware uses sophisticated techniques to infiltrate computers and hide from its victims. Use Reimage to determine whether your system is infected and prevent the loss of your files. Why can’t you trust Antivirus 10 with your computer’s security? How did this scareware end up on my PC? What is the secret of Antivirus 10 removal? Play pretend is not a children’s game anymore as deceptive programs like Antivirus 10 virus are making their way to the Web in increasing numbers. This particular virus is a rogue application which manipulates social engineering tactics  and deceptive software design to imitate a legitimate antivirus program and coax the users into purchasing its full version. The virus not only replicates the appearance of a regular antivirus software but, more importantly, fakes system scans and presents false reports about the system’s condition. Moreover, the victims are threatened that if they ignore the scan results and do not “clean up” their devices using the full version of the program, their computer system and containing files might be damaged; sensitive information may leak and trigger various privacy infringements. Let us assure you. This is unlikely to happen because your computer is not actually at any major risk. In fact, the only thing that might be causing trouble on your device is the Antivirus 10 malware that has gained unauthorized access to your device and started running on it without being explicitly asked to. Besides, the program modifies itself to launch at startup and run scheduled “scans” every few hours. As you can imagine, these constant processes are not beneficial for the performance of your computer. Because of the increased CPU usage , the device may start running slower; other programs may begin to crash or freeze more often. If you, your family or friends find this rogue application on your computers, please take the proper precautions and remove Antivirus 10 from your devices safely. To avoid mistakes and further damage, employ trusted antivirus tools like Reimage for the virus elimination. 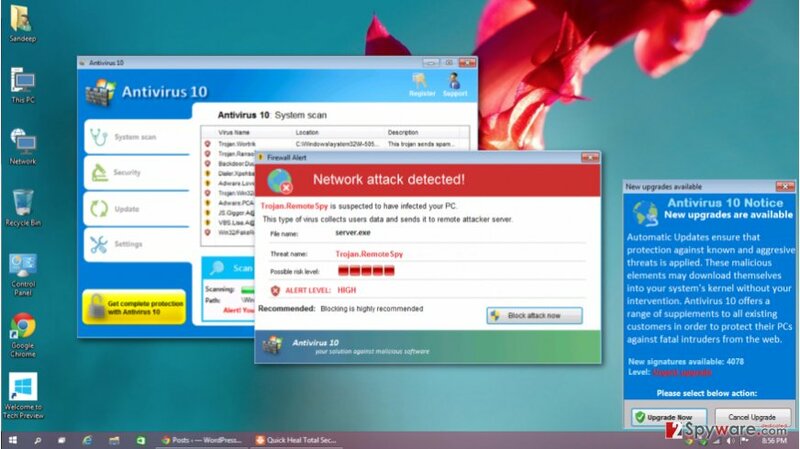 Antivirus 10 hijack is annoying and malicious in a lot of aspects. Besides the already mentioned negative impact on the system’s performance, the windows scan results and ads urging you to purchase the full version of the application may pop-up randomly, overlaying other running windows and programs. This is inevitably interferes with the computer usage experience. What also causes inconveniences to the infected computer users is the fact that the virus also blocks chrome.exe, opera.exe, firefox.exe and a variety of other programs, including Microsoft Office apps and even antivirus scanners. This helps the virus create an impression of a seriously infected system and persuade the users into purchasing the full program. Needless to say, you should better consider the Antivirus 10 removal instead because not only is this program useless, but it also poses a serious danger to the computer’s stability and security. The security experts introduce Antivirus 10 as a Trojan  which is a type of virus which infiltrates computers disguised as legitimate software or comes attached to the pirated software or illegal program cracks . Such programs are usually distributed via shady software distribution sites, peer-to-peer sharing networks, and torrent sites. Nevertheless, it is not uncommon to find completely legitimate software bundled with Antivirus 10 on inconspicuous websites as well. Thus, you should stay vigilant at all times and always to a research before trusting your computer’s security to programs you are unfamiliar with. First of all, we should remind you that Antivirus 10 virus is not a regular antivirus program that can be simply uninstalled from the Add/Remove programs list. To avoid removal, the virus may scatter its malicious files all over your PC, making the manual Antivirus 10 removal extremely complicated. But if you cannot exterminate the virus manually and the malicious source code is blocking your antivirus from running, how should you remove Antivirus 10 from your PC? Well, first, you will have to run your computer in Safe Mode  to decontaminate some of the malware’s functionalities. You will find the following steps indicated below. In case Antivirus 10 is blocking your antivirus and now allowing you to run the program smoothy, you should follow the steps we indicate below. Log in to your infected account and start the browser. Download Reimage or other legitimate anti-spyware program. Update it before a full system scan and remove malicious files that belong to your ransomware and complete Antivirus 10 removal. To stop the malicious Antivirus 10 processes and regain control of your antivirus and other programs, please complete the steps included in the following guide. Just don’t forget to scan your computer afterwards! When a new window shows up, click Next and select your restore point that is prior the infiltration of Antivirus 10. After doing that, click Next. Once you restore your system to a previous date, download and scan your computer with Reimage and make sure that Antivirus 10 removal is performed successfully. Guide which is presented above is supposed to help you remove Antivirus 10 from your computer. To recover your encrypted files, we recommend using a detailed guide prepared by 2-spyware.com security experts. ^ Wendy Zamora. Hacking your head: how cybercriminals use social engineering. Malwarebytes labs malware news. ^ What does high CPU usage mean on my computer?. Nowhow. PC support site. ^ What is a Trojan Virus? - Definition. Kaspersky lab news blog. 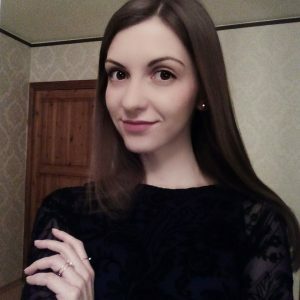 ^ Ioana Bistriceanu. Dangers of using pirated software. Bitdefender antivirus news. ^ Microsoft Windows Safe Mode – All You Need to Know. COMBOFIX. PC help page. This entry was posted on 2017-01-02 at 07:44 and is filed under Rogue Anti-Spyware, Viruses. You can quickly scan the QR code with your mobile device and have Antivirus 10 virus manual removal instructions right in your pocket. How did you remove Antivirus 10 virus?